For those that appreciate Wright’s work, there is a conception and birth. For myself it was the Henderson House. The realization that this home was more than a house. There was depth I couldn’t quite put my finger on. There was more than met the eye. It truly was a piece of art. And I needed a clearer understanding. 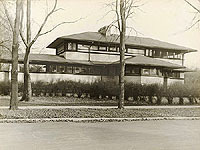 The Henderson Residence was one of Wright’s earliest Prairie styled homes and only home in Elmhurst. 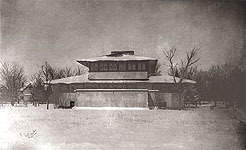 His first experiment with the Prairie style was the Municipal Boathouse, Madison (S.022, 1893). Distinctively Prairie. He touched on it again a year later when he designed the Winslow Residence and Stable (S.024-025, 1984). In 1899 he designed the Husser Residence (S.046). Another precursor to the Prairie style. But it wasn’t until 1900 with the Bradley Residence (S.052) and Stable (S.053) that the Prairie style fully blossomed. In 1901 came the Willits Residence (S.054), Gardener’s Cottage and Stable (S.055). There was a slight departure with the Hickox Residence (S.056). But the Henderson Residence is authentic Prairie. 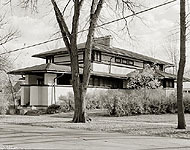 In essence the Henderson Residence was his fourth Prairie styled house. 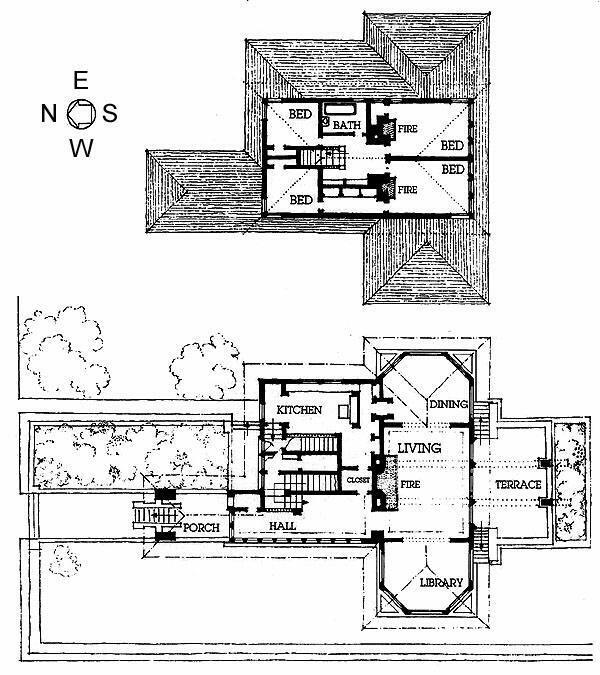 Wright describes this new prairie styled home in An Autobiography, Wright 1943 pp 141-145, (His Life and His Architecture, Twombly 1979 pp 66-67). Wright had a brief partnership (1901-1902) with architect Henry Webster Tomlinson (pp 5-6), which was first mentioned in a print announcement dated January, 1901 (Decorative Designs, Hanks, page 76). This was the only partnership Wright ever admitted to. As a result, Wright and Tomlinson are listed as the architects of the Henderson Residence. But Grant argues that Tomlinson was strictly an office manager and business agent. Walter W. and Marion S. Birkin purchased the home and lived there for 19 years. In 1945 Harley R. Kimmel purchased the home and lived there for one year. 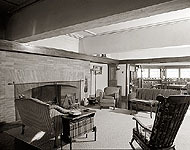 In 1946 Louise R Haines purchased the home and lived there for one year. In 1947 Chester & Ruth Shaffer purchased the home and lived there for 21 years with their four children. In 1968 Roger A. and Joan Schmiege purchased the home and lived there for twenty years with their three daughters. 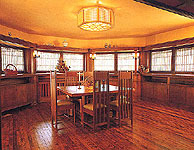 In 1988 David and Joyce McArdle purchased the home and lived there for six years. 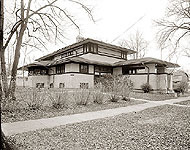 The McArdle’s were responsible for the restoration of the home, working with Don Kalec, director of the Wright Home and Studio in Oak Park, in planning the extensive restoration. 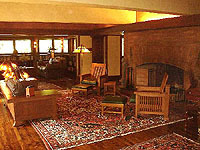 In 1994 Patrick and Patricia Fahey purchased the home and are presently the owners. As of this date they are attempting to sell the home. There were many classic Prairie styled details. The basic materials are wood, stucco and brick. Strong horizontal lines, low-pitched roof, broad overhanging eaves, horizontal rows of leaded glass windows and doors, the prominent centrally located fireplace and chimney, a terrace and covered porch. 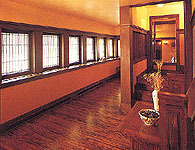 There are over 80 art glass windows, elegant woodwork, three brick fireplaces, and many original built-ins. 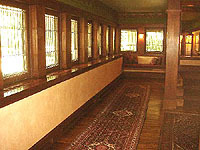 The 27 foot long entry Hallway includes built-in seating and stippled ceiling finish. The trim is stained mahogany and the flooring is quarter-sawn maple wood. The original gas two light wall sconces were converted to electricity, and then later were replaced by Art Glass prairie styled single vertical sconces. All the radiators are encased with original and custom wood grill work. The 60 foot expanse from the Library on the west end, through the Living Room to the Dining Room on the east. The magnificent twelve foot wide brick fireplace is the center of the home. The octagonal Library includes built-in bookcases, and the matching octagonal Dining Room has built in cabinets and buffets. The hanging light fixture has been replace a number of times over the years. Art glass French doors in the Living Room lead to the terrace on the south end. 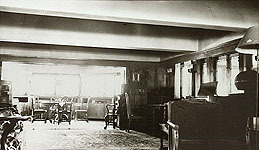 By 1935-1940 the back terrace had been covered and the floor above it was enclosed. In 1975, the Terrace was restored to it’s original condition by removing the covering and the floor above it. Extensive restoration began on the exterior in the 1980s and the interior in the early1990s. Text by Douglas Steiner, Copyright November 2008.
illustrations of those designs. The club's first illustrated catalog was for its fifth exhibition in 1892. 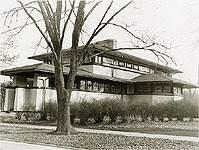 The Chicago Architectural Club sponsored the exhibitions and published the catalogs through 1920. This illustration was published in the 1902 Chicago Architectural Sketch Club Catalog, page 57.
numbered I through LXIV and included eight with a or b. 28 were tissue overlays and were attached to the corresponding plates. Each set also included a 31 page introduction, consisting of unbound sheets, folded once. Tafel XXVII Wohnhaus Für Herrn Henderson im Vorort Elmhurst, Ill. (Plate 27) 1910. Detail of Tafel XXVII (Plate 27) 1910. Floor plan copyright 1993, “The Frank Lloyd Wright Companion” Storrer, William Allin, page 54.
doctoral dissertation titled “Frank Lloyd Wright's Work Before 1910". 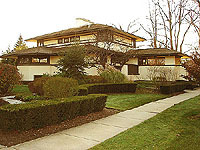 While a professor at the University of Pennsylvania, he elaborated his thesis and published his book “Frank Lloyd Wright to 1910: The First Golden Age" in 1958. Upon publication, Manson hand delivered a copy of the book to Wright in New York. encased with original and custom wood grill work. The magnificent twelve foot wide brick fireplace is the center of the home. The octagonal Library includes built-in bookcases, and the matching octagonal Dining Room has built in cabinets and buffets. The hanging light fixture was replaced. 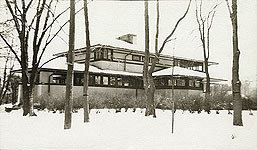 "﻿Ausgeführte Bauten und Entwürfe von Frank Lloyd Wright" Wright, 1910, Tafel XXVII. "The Book of Chicagoans", Marquis, 1917, page 318. "The Nature of Materials: 1887 - 1941", Hitchcock, 1942, pp 32, 42, plates 66-68. 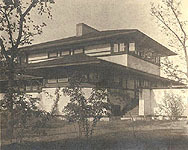 "Frank Lloyd Wright to 1910, The First Golden Age", Manson, Grant, 1958, page 108, 216. "Studies and Executed Buildings By Frank Lloyd Wright", Wright, 1975, Tafel XXVII. "Frank Lloyd Wright, His Life and His Architecture", Twombly, 1979, pp 66-67. "Frank Lloyd Wright Monograph 1887-1901", Vol. 1, Text: Pfeiffer, Bruce Brooks; Edited and Photographed: Futagawa, Yukio, 1991, pp 204-207. 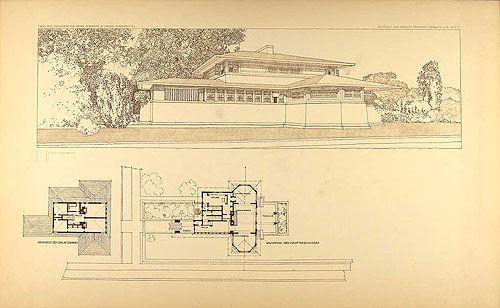 "Frank Lloyd Wright In His Renderings 1887-1959", Vol. 12, Text: Pfeiffer, Bruce Brooks; Edited and Photographed: Futagawa, Yukio, 1990, plate 19. 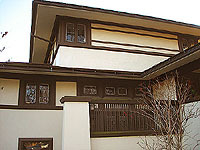 "Frank Lloyd Wright Prairie Style Masterpiece", Balluff, 1992, pp 8. "The Wright Style", Lind, 1992, pp36, 120-121. "The Frank Lloyd Wright Companion", Storrer, William Allin, 1993, page 54. "Frank Lloyd Wright and the Meaning of Material" Patterson, 1994, page 22. 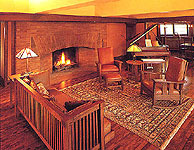 "Frank Lloyd Wright’s Fireplaces" Lind, 1995, pp 29-31. "The Vision of Frank Lloyd Wright" Heinz, 2000, page pp 81, 84, 99-100. "Frank Lloyd Wright’s Houses" Heinz, 2002, page 20-21. "Life & Works of Frank Lloyd Wright" Heinz, 2002, page 104. "﻿National Register of Historic Places, Henderson, Frank B. Residence" Follett, 2002, pp 26. "Frank Lloyd Wright's Chicago", O'Gorman, Thomas J., 2004, pp 130-33, 139, 148, 166. "Frank Lloyd Wright Prairie Houses", Hess, 2006, pp12, 38-47. 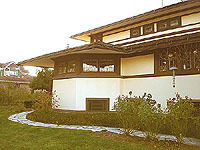 "Frank Lloyd Wright’s Henderson House" Historic Homes Reality, 2008, pp 4. 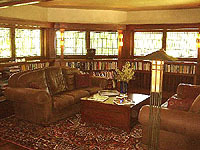 ﻿"Frank Lloyd Wright American Master", Weintraub; Smith, 2009, pages 46-49. C) The Book of Chicagoans - Published by A. N. Marquis & Company, October 1917, Page 318.